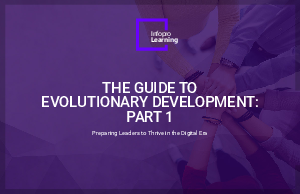 Learning leaders are searching for new ways of thinking about leadership development – and for good reason. In the U.S. alone, companies spend more than $15 billion annually on leadership training programs. Yet, 71 percent of organizations do not feel that their leaders are prepared to lead their businesses into the future. Not only are your leaders (from executives to middle managers to new managers) the foot soldiers of your organizational culture, they maintain the competitive advantage and growth of your business. A leader’s impact on the bottom line cannot be ignored; leaders drive innovation and productivity, capitalize on business opportunities and develop and retain top talent. A leader’s responsibilities in today’s business environment are daunting. Rapid and dramatic changes in the workforce are impacting every aspect of the organization, threatening old ways of thinking, entrenched interests, and established models.